Palestinian riders taking the bus to work in Israel will have to walk to the border under new security measures that ban Arabs from buses in the West Bank after concerns for the safety of Israeli settlers. The bus ban will affect many of the 85,000 Arabs who live in the territory but commute into Israel itself every day for work. Until now, this labour was bused in on routes calling at several towns outside the border before undergoing comprehensive security checks, however the commuters will now only be able to board buses once they are inside of the territory itself. Until that point they will make their own arrangements, or have to resign their jobs. Banning the Arab migrant worker population from the buses has long been called for by Israelis who share the buses, who claim they are at risk from “rampant” sexual harassment, and terrorist attack. The ban has been resisted until this point, reports The Times because the workers are already comprehensively searched upon arrival at the border, however on present track it will begin next month on the orders of the defence minister. Public transport has long been a primary target for Palestinian terrorists on their war to destabilise the Israeli state, and there have been dozens of attacks on Israeli buses over the past thirty years. The Hamas Beersheba attack in 2004 employed two suicide operatives wearing bombs under their clothes, which were detonated on two crowded buses within minutes of each other. The 16 killed and over 100 injured were mostly shoppers returning from market and students. The youngest victim was only three years old. Another bus attack by Hamas earlier the same year targeted a campus hospital shuttle bus, killing eleven and wounding over fifty. In 2003, over 100 people were killed and many more injured in a number of attacks on buses and bus stations by Hamas. 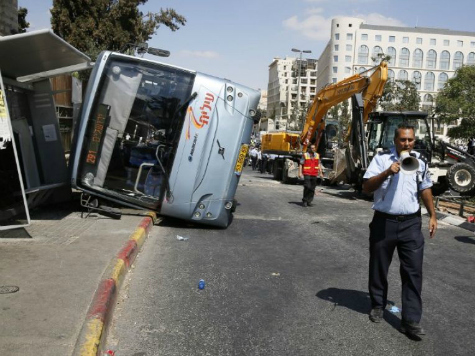 Attacks on buses have now apparently returned after a terrorist driving an excavator rammed a bus, overturning it on a busy street. One was killed and six injured. There was significant opposition to the move to ban Arabs from West Bank buses from liberal Jews in Israel, and Palestinian workers groups. Shaher Saad, head of the federation of Palestinian trade unions said: “The separation of bus lines was done in the past by racist regimes, and it should not be acceptable in this state”.